Today, the pair lost about 50 points amid negative statistics on the UK industrial production. GBP is extremely vulnerable, as the decline in the manufacturing sector is likely to have a negative impact on the labor market. Moreover, UK trade balance deficit has increased significantly, while British experts predicted a surplus both in the EU and outside it. USD demonstrates strength, despite the mixed results of the G7 summit. On Wednesday, the Fed will announce its decision on the interest rate with high probability of raising it to 2%. Given the weak performance of the British economy, the market expects the further decline within 1-3 days. Tomorrow at 10:30 (GMT+2) data on the UK labor market will be published, which are expected to be significantly worse than the forecast, and the pair may fall to the area of 1.3290-1.3250. At 14:30 (GMT+2), the US Department of Labor Statistics will publish data on the consumer price index, which is very important for the Fed's decision. On H4 chart, the instrument is trading below Bollinger Bands. The indicator is directed sideways, and the price range has expanded, which indicates a further decline. 1.3350 is a strong support level, its breakout will be a signal for opening sell positions. MACD histogram is in the neutral zone, the signal for entering the market is not formed. Stochastic does not give a clear signal to open positions. Support levels: 1.3126, 1.3207, 1.3255, 1.3317, 1.3350. Resistance levels: 1.3386, 1.3411, 1.3456, 1.3487, 1.3529. Short positions may be opened from the current level with targets at 1.3250, 1.3200 and stop-loss at 1.3460. Implementation time: 2-3 days. 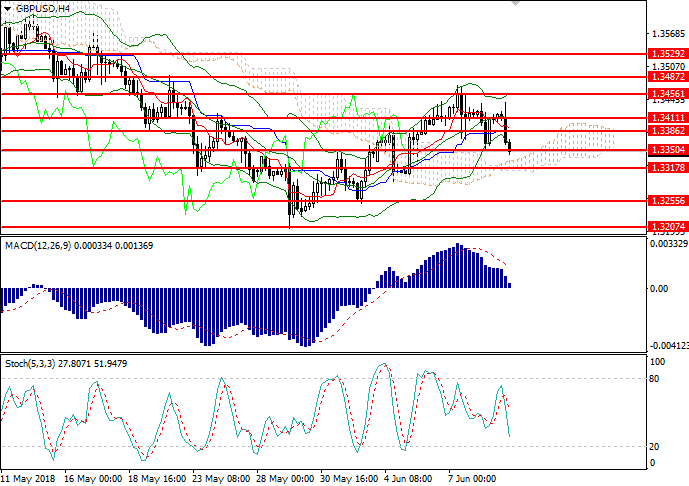 Long positions may be opened from the level of 1.3475 with targets at 1.3560 and stop-loss at 1.3425. Implementation time: 1-3 days.